Join the discussion on our forums! Come discuss Lotus Agents over in our dedicated Lotus Agents discussion topic. Battlecry: Discover a Druid, Rogue, or Shaman card. Mostly, they stand around and look cool. I'm a casual Wild player, but I found a fun use for this card. The most important card in Burgle Rougue is Spectral Cutlass, and Ethereal Peddler is a powerful support card for the deck. Both want you to play cards from a different class, and multiclass cards like Lotus Agents count as being in a different class. Lotus Agents can get you two durability charges on Spectral Cutlass and potentially a good card for however the game is going. Admittedly I've been trying to get a Jade / Burgle Rogue deck to work, and it's been fun at least. But if your Spectral Cutlasses are destroyed, you probably lost. I'm sad to state this, but with recent "hidden" hotfixes, tri-class cards don't grant an extra durability anymore. And also why Drakonid Operative should be nerfed as a 5/4 or 5/3 minion. This card is very good in aggro tempo rogue. I just replaced both Azure Drakes with this one and it works great. While it has obvious downsides in comparison to Azure Drake while playing against Priest, for example, the ability to discover some heavy late game cards or just much needed situational cards is amazing. This card works in fast decks, such as aggro rogue, as i already mentioned. It can give you removal, taunt vs aggro, add some damage for lethal, or if you lucky enough Anubarak vs control warrior, alakir + coldblood, etc. In slow rogue decks it is almost unplayable, in druid it is also a lackluster because on high mana you usualy want to play beefy minions or just remove garbage from opponent's board with spells. But this card seems worst in shaman, because almost every other shaman card is just far more superior than this one. This card is getting override by Azure Drake, I think the reason why because of the experiences I had it. The good moment can come when you can get another Aya or giant minions or spells, but the meta is very quick now, so this is the reason the card isn't played by anyone. In terms of fun, this card has still awful list of cards that limits your discoveries, you don't want to get such as totemic might (the 0 mana shaman card) or many useless rogue cards, but you can still get amazing game changing such as deploying another jade golems or bring out that Ancient of War, Earth Elemental, Elemental Destruction or even Moonglade Portal, so this card heavily depends on RNG and can be risky to play this card if you want to climb ladder. But Azure Drake is way less risker plus you can draw a card from your deck so you get the card you always need from your own constructed deck and you get a nice 1+ spell damage. If only some useless cards from shaman and rogue aren't so bad.. this card can be at least viable, now it's not that good. I wish I could find a place to fit this card into a deck because I have a golden one and I love the way they say "Balance in all things" in unison. Lol, I came here just to see what they said when played, and your comment was the first on the page. Try burgle rogue. Has good synergy with Ethereal Peddler as well. I love this card. The entrance sound is amazing, I love the art, and I think it's the only card to feature a pair of entities. Also, nothing can compare to Ancestral Spirit on an Ironbark Protector. Not even Ancestral Spirit onto Earth Elemental? Ironbark Protector has better stats. Besides, it's a druid card, and that's what happened one game. Lotus Agents to Ancestral Spirit to Ironbark Protector. I want to use this, but I can't seem to find room for it in my deck. How good is this card? It's average. It's not bad... it's like an Ethereal Conjurer. It's downside is 1 less attack, but upside of discovering cards that give your class abilities it doesn't have access to. Might not be enough room for it in many decks as it competes with Azure Drake. It can't really compete with Dark Iron Skulker either. Lotus Agents just looks too expensive. Reno Rogue is... well, I wouldn't say it's my specialty, but it's the deck that I play the most out of anything else. With Pirate warrior and the two Paladin variants, I think having access to the Dark Iron Skulker makes sense. So is anyone else thinking that this card has started to look a lot better considering what we now know about the Jade Golem mechanic? Like, Rogue and Shaman right now only have so many ways of summoning these things and the more Jade Golem cards you play, the better each successive one becomes. So using this card to potentially get 1 or 2 more cards that summon them (especially Druid's Jade Idol) could be a huge value gain, like better than just drawing another card from you deck ala Azure Drake. 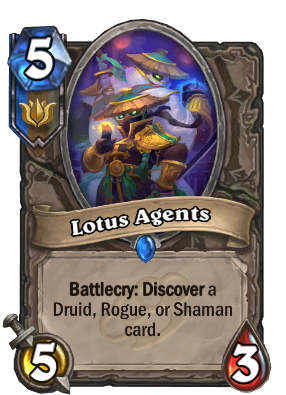 I guess this depends on how good Jade Lotus decks actually turn out to be but Lotus Agents may be the only way Rogues & Shamans will ever be able to summon anything bigger than a 6/6. May be Blizzard is gonna use that 5-Attack like "Whenever you summon a minion with 5-Attack, give it Charge!? ", look at Aya Blackpaw, Lotus Assassin and Wind-up Burglebot... Or it's just a stupidity. Idk, I can't find any reason to not make this 5/3 instead of 4/4 or 3/5. One day someone will do the math on how good/bad this card is with the range of discoverable cards it offers.